When you keep dishes warm at your hot buffet, your foods will stay hot for longer amounts of time. You'll also reduce the amount of thermal shock your dishes go through when they carry hot foods. 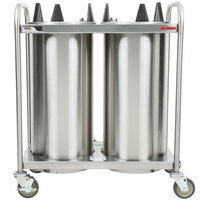 Thanks to these mobile heated plate and dish dispensers, you can keep dishes of various sizes warm throughout service. 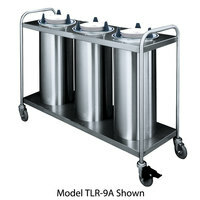 Place these carts at the beginning of your buffet line where guests line up, or keep them anywhere it's convenient! 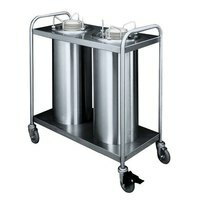 We have open or enclosed mobile heated plate and dish dispensers, depending on your preferences. Enclosed models are ideal for formal banquet halls because they conceal the cylindrical dispensers, but both styles feature an attractive silver sheen that blends with any decor. 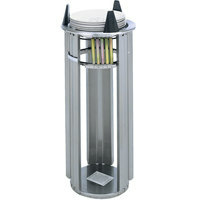 Since they come with a self-dispensing mechanism, these units will continue to lift dishes out of the dispenser cavity, so customers can always find a sanitary plate.